This frame is free to a good home; this has been posted a couple of months ago. It is a terrible thing to take any Model T items to a scrap yard, I know, but I simply do not have the space to keep it. I will hold onto this '26 - '27 frame for one week. The first one in the door gets it. If it's not picked up by the end of the day on Monday, 12-23-13, it goes to Martin's scrap yard in Byhalia. Disgusting! But I understand. I cannot save everything, and neither can you. Surely someone within a hundred miles has a garage to slip it behind? If I was within a hundred miles, I would come and get it. Bill E, I love that '11 in your profile photo! My nice lives in Tenn but Im not sure where. I sent her an e mail. Will, I live in the southwest corner of the state. Thank you, Wayne. Your cars are pretty sharp, too, especially your speedster. 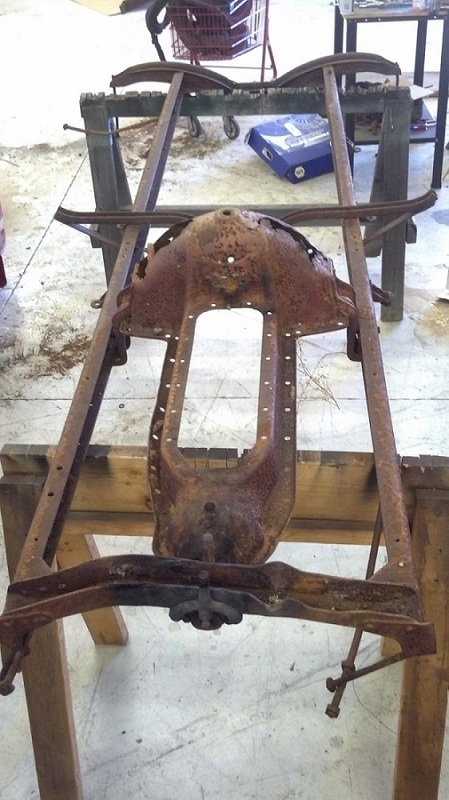 I have 2 car frames,1 in nice shape,but just dont like seeing stuff lost to china scrap. Are you related to the Grim Reaper? Maybe that ole Ford steel will come back from China in nails to build a new barn to house old Ford parts we can save for the future. Hey Bill, are you going to Chickasha this year? A forum member has requested I sell him the rear cross member. If the other forum member (close by) who wants the frame doesn't come get it, I'll remove the rear cross member and ship it to the forum member who wants it. I'll ask only the UPS freight. Tick Tock, Tick Tock, etc. The idea of sending anything T to a scrap yard hits me the same way as fingernails on a blackboard. Someone, anyone, PLEASE come get this frame. Kep will mail you a fat check for shipping! I haven't been since '99; every year, I say, "I'm going to Chickasha this March! ", and then something usually comes up at work. I keep hoping I'll make it this year. Thank you Bill Everett for trying! I keep hoping someone a couple thousand miles closer would grab it. W2; the cheering section stuck on the leftist coast.